Bonk was a comic strip character that first made an appearance on a Japan PC Engine Monthly magazine. Originally featuring upcoming games in comics, the magazine was converted to PC Genjin, which was a spoof of PC Engine. The spoof magazine featured the genjin as its mascot, which means caveman. This mascot became an instant hit that Hudson together with Red, the designer of the character, developed a game on the basis of the character. A game was developed where Bonk was featured in a colorful world, much like the same as that in Hudson Entertainment’s Adventure Island. 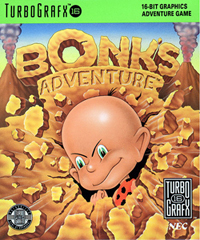 When Bonk’s Adventure was launched in 1990, it became a phenomenal hit, earning rave reviews from various gaming critics and earning accolades. Bonk was an original during his time. While it featured the usual power-ups as well as end-of-level bosses, Bonk’s Adventure was, as a whole, such as wacky game. It was so wacky that some characters were exact caricatures of people at Altus and Hudson. Bonk’s greatest weapon was his head. He used it not only to solve puzzles or defeat his enemies, but it was also very important as it was used to perform spins mid-air only to land on his enemies and defeat them. His jaws was also important in that it was used to climb cliffs. The game was also known for featuring unique levels such as the innards of a dinosaur. After the hit Bonk’s Adventure, two more sequels for the TurboGrafx-16. 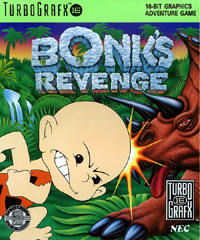 Bonk’s Revenge was an improved version of the original one, featuring brighter graphics and sound. The levels were more advanced than the previous version plus it also included an insane amount of secrets and level bonuses. Bonk 3 was then released after, about at the end of TurboDuo’s lifecycle. For this version, features include new play schemes and cooperative multiplayer. The Bonk 3 was largely a limited production in CD-ROM format and HuCard. 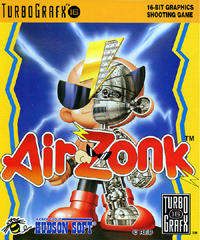 Hudson and Red had ambitions to expand the Bonk universe, and in 1992, Air Zonk was born. Originally named Bonk’s Thunder Shooting, Air Zonk was a cyborg descendant of caveman Bonk. Zonk, the new mascot’s name, was a cooler version of Bonk, sporting a punk style with some cool shades and a more youthful attitude. The game in itself was dubbed as having reached the highest level of creativity in the series because of its hilarious enemies and out-of-this-world animation. There were also a handful of Bonk games that made it to the Nintendo Game Boy. Bonk’s Revenge for the Game Boy featured different Bonk transformations, from Stealth Bonk, Master Bonk to Hungry Bonk. Bonk also has a new enemy in the form of Mechabonk. Another game patterned after Bonk was also exclusively released in Japan – GB Genjin Land: Viva! Chikkun Oukoku. 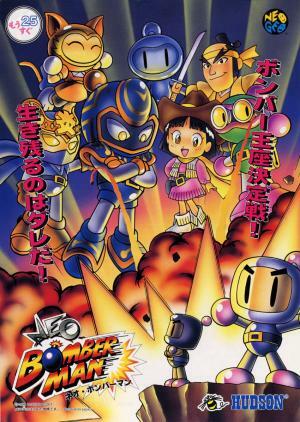 Bonk’s for arcade was also released by Kaneko. In this version, two players are allowed to compete and complete together 28 levels. This game version had more enemies in a single screen and has other weird tasks as compared to the original Bonk game. Bonk for Super Nintendo was also made available. Known as Super Bonk it even added crazier bosses, a number of unique bonus levels, and more comprehensive backgrounds. Although Bonk has had a hiatus, Hudson Entertainment is keen on bringing back this well-loved 90s game!